Brenda van Stralen, Krissy Turner, Mick Darcy, Tom Gosselin, and all 11 Northeast Conference women’s soccer head coaches checked in at league headquarters in Somerset on Nov. 30. With the NCAA Division I season officially coming to a conclusion this weekend with the College Cup, the heads of the NEC’s programs came together for their annual administrative meeting. End-of-the-year issues and coaches’ recommendations are usually discussed via postseason teleconference, but this fall’s agenda was so vast an in-person meeting was called. While in the room, the 11 men and women along with NEC commissioner Noreen Morris and league sport administrator Michelle Boone discussed a number of issues including the future of conference scheduling and an online video exchange program. “In my experience, face-to-face meetings have a tendency to be more productive, and with the breadth of issues facing us this offseason, we felt it was necessary to bring everyone together,” said Boone. The group also touched upon a number of “hot” topics currently hovering over the national scene. Coaches are permitted to put forth recommendations, and, if passed by the group through a majority vote, those recommendations then move onto the NEC Sport Management Committee for review and must eventually receive approval from the AD/SWA group in order to take effect. @yeaahmare – What is wrong with microsoft word!!? @dajones19 – U will never understand my life unless u walk in my shoes..
Velton Jones is the latest to do it, but not the first. Robert Morris’ junior guard carried the Colonials to a win over CAA member James Madison last week by scoring 38 points. The “small guard with the big game” (as we like to refer to him over here at Overtime!) shot 67 percent from the field during the memorable performance at the Philly Hoop Group Classic and turned the ball over only once despite touching it nearly every time down the floor. Jones is averaging 4.7 assists per contest and has committed only 10 turnovers thus far this season. Although no NEC player comes close to topping his league-leading assist-to-turnover ratio (2.8:1), there is one man out there who has a higher single-game scoring total than Jones’ 38. Central Connecticut rookie Kyle Vinales scored 39 points against Niagara on Nov. 14 and no other player has been able to match that yet. Like Jones, Rhode Island’s Jamal Wilson and Saint Joe’s Karl Jones have both scored 38 in a game this season, but not 39. Vinales was no one-hit wonder either. The first-year Blue Devil continued his tear this past week, averaging 27.0 points over a pair of victories. The 29 he scored in the win over UMBC and the 25 he dropped in against Hartford landed Vinales his third consecutive NEC Rookie of the Week award making him the first-ever NEC player to open the season on such a run. So as the opening month of the season comes to a close, Vinales is the nation’s second-leading scorer (24.0 ppg). Not bad for a rookie. @PONY_59 – Why do Nike and under armor commercials always make me wanna go run or lift? We overindulged ourselves at the Thanksgiving dinner table here at Overtime! and the tryptophan took its toll. In fact we are all just now waking up from our slumber and, boy, did we miss a lot of action. Danes’ Great Season Comes to Close – NEC champion UAlbany put forth a solid effort in the NCAA FCS playoffs before succumbing to Stony Brook. The Great Danes were knocking on the door for the game-winning score when all-NEC quarterback Dan Di Lella’s pass was tipped and intercepted in the end zone with under 1:00 remaining. The turnover allowed Stony Brook to hang on for a 31-28 win, but it shouldn’t overshadow all the great things Di Lella and the Danes accomplished this season. Read more about the game. VJ Starts Week off Right – Velton Jones torched CAA member James Madison for 38 points in what was the first of two wins for Robert Morris last week at the Philly Hoop Group Classic. Three days after topping JMU, Andy Toole’s Colonials posted a 51-44 win over Philadelphia-based LaSalle. Following non-conference wins over members of the CAA and Atlantic 10, RMU came up 10 points short against cross-town rival Pittsburgh (Big East). Read more about RMU. Blackbirds Go Gobble, Gobble – Long Island women’s basketball defeated a pair of Atlantic 10 members to win the annual LIU Turkey Classic. First, Gail Striegler’s Blackbirds handed previously-unbeaten Charlotte a loss to set up a contest against LaSalle for the tournament title. Preseason all-NEC forward Ashley Palmer poured in 26 points to lead LIU past LaSalle and garner Tournament MVP honors. Read more. Quinnipiac Conquers Concord Hilton Classic – Tricia Fabbri’s Bobcats did more than their share in what was a phenomenal week for NEC women’s hoops teams. 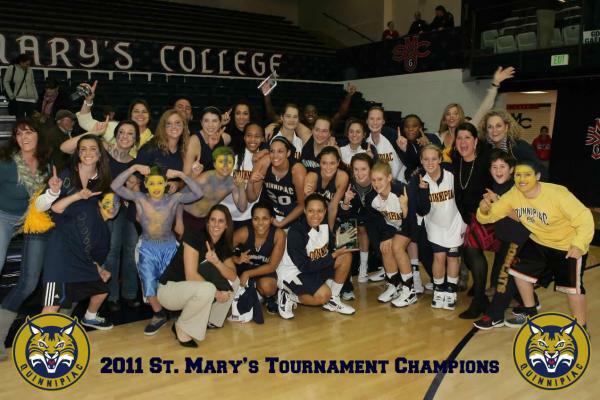 Eleven NEC teams combined to win 16 games with two of those victories coming courtesy of Quinnipiac in its trip to St. Mary’s Concord Hilton Thanksgiving Classic. The Bobcats eked out a 64-62 win over Big Ten member Minnesota before topping host St. Mary’s in another two-point decision to claim the tournament crown. Guard Felicia Barron averaged 17.5 points per contest on the way to the Tournament MVP award. Read more. The votes have been tallied and the All-Northeast Conference honorees will officially be announced tonight on Thanksgiving Eve. Overtime!, however, has obtained a sneak peek at the list. The leading rusher in all of NCAA Division I FCS will also add the NEC Offensive Player of the Year title to his resume. Bryant’s Jordan Brown amassed well over 2,000 yards from scrimmage on his way to claiming the league’s top offensive honor. Fresh off its shared league title, Duquesne places one of its own amongst the major award winners as Serge Kona is set to receive the NEC Defensive Player of the Year award. Monmouth’s redshirt freshman receiver Neal Sterling, who is one of 20 national candidates for the 2011 Jerry Rice Award, was a near unanimous choice for the NEC Offensive Rookie of the Year award. UAlbany, which will represent the NEC in the FCS playoffs this Saturday at Stony Brook (in a game that can be seen live on ESPN3, had two major honorees. Great Danes’ freshman linebacker Kyle Jordan will be able to call himself the NEC Defensive Rookie of the Year. 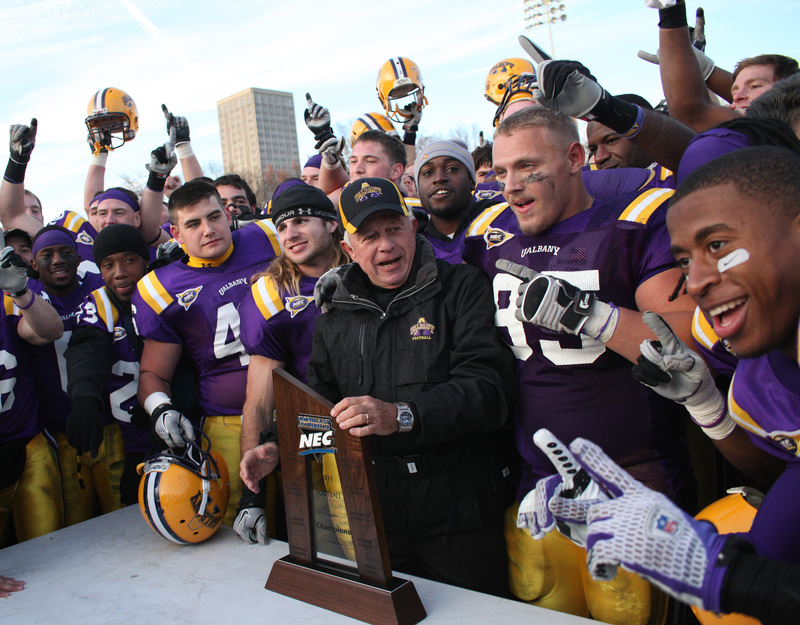 Meanwhile, “The Architect of UAlbany Football” and the NCAA Division I active wins leader – Bob Ford – adds another NEC Coach of the Year honor to his storied career. An official press release is expected on NortheastConference.org tonight. The dust has settled on the 2011 regular season. While UAlbany readies to represent the NEC in Saturday’s NCAA FCS First Round showdown at Stony Brook, the NEC staff is busy conducting the all-conference awards process. Through a vote of the league’s nine head coaches, the NEC will name two 25-member all-conference teams and five major award winners – Offensive Player, Defensive Player, Offensive Rookie, Defensive Rookie, and Coach of the Year honors. Being that there is nothing like talkin’ football around the Thanksgiving dinner table, NEC fans will have a chance to see what their relatives think about the 2011 All-NEC Football Teams. The conference plans to announce the award winners on Wednesday, Nov. 23, just in time for Turkey Day. Overtime! will be one of the first to break the news, so give us a visit on Thanksgiving Eve to see if your favorite NEC player is now your favorite all-NEC player. and his Great Danes receive come Wednesday? @BonnieBernstein – Arizona AD announces Rich Rodriguez hiring on Twitter? Just the latest example of how social media is starting to rule the world.